University College Cork with State Street Corporation and Zhejiang University invite applications for this unique, industry-focused career-defining postgraduate research experience in the State Street Advanced Technology Centre (ATC) in Cork University Business School. 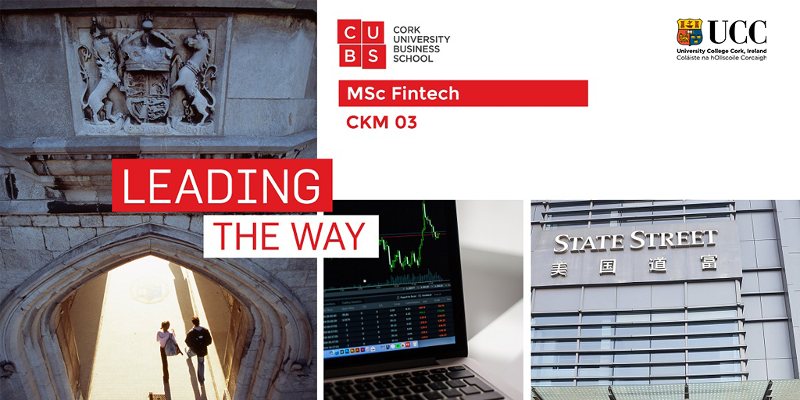 We are currently accepting applications for a September 2018 start on the MSc by Research in Fintech programme and will have 20 fully funded research positions available. · Will be enrolled in the full-time MSc by Research for one year, full time, with a start date of September, 2018. · Will receive an internship from State Street (concurrent with the year of enrolment) with an annual salary of up to €20,000 (students are responsible for paying their own fees for the MSc). · Will have academic supervisors from UCC, a co-supervisor from Zhejiang University and an industry advisor from State Street. · Will conduct original research in cutting-edge Fintech (specific topics and appropriate research methods will be set by the ATC operating committee). · Will leverage their research to author, with their supervisors and advisor, research articles for both peer-reviewed publications and an industry audience. · Will submit a portfolio of articles for examination and fulfilment of the MSc degree. · Will be able to apply to receive travel support to support their research. · Will be able to apply to continue their funded research, through migrating their research from an MSc to PhD. a demonstrated an aptitude for creative problem solving, analytical and critical thinking, and effective written communication. a demonstrated a capacity for both self-directed independent work and effective collaboration within teams. a strong and relevant academic record (2H1+ in Information Systems, Finance, Computer Science, Mathematics, Commerce, Law, Engineering or related field). Brookfield Health Sciences Complex G01. Interested parties can learn more about the centre/programme and engage with a number of State Street ATC Research Ambassadors who will be present at the event. State Street personnel will also be present to chat with interested parties.